Mold in your crawl space can affect the health of your home and family. Mold spores in the air can cause allergy and asthma flare-ups. The best way to prevent crawl space mold is to keep the crawl space dry. 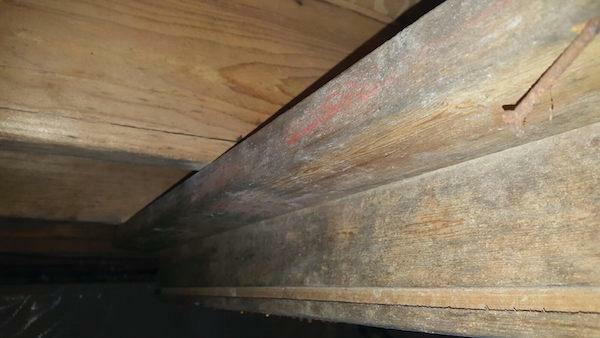 Before waterproofing and sealing the crawl space, MidSouth Crawlspace Solutions will treat existing mold with our quick and effective mold treatment solution. Schedule your free cost estimate today to learn how we can help give you a dry and healthy crawl space. We serve Jackson, Meridian, Brandon and surrounding areas in Mississippi. MidSouth Crawlspace Solutions uses a combination of encapsulation and mold-killing spray to effectively eliminate and prevent mold and mildew in the crawl space. See how Mold-X2 kills crawl space mold in just 20 seconds! We use Mold-X2 products to quickly and safely remove mold spores and stains. Mold-X2 Stain Remover works in just 20 seconds to remove mold stains from building surfaces, such as wood and masonry. Mold-X2 Botanical is an all-in-one antimicrobial, fungicide, and disinfectant that helps prevent mold from growing back on building services. Mold-X2 Botanical is made of an all-natural thyme-based formula that eliminates musty odors without harmful chemicals. Once the mold in your crawl space has been treated, you need to protect the space from future mold growth. Encapsulating the crawl space with the CleanSpace vapor barrier will seal out humid outside air and a dehumidifier will remove excess moisture from the crawl space. If you have a severe mold problem in your crawl space, it might be necessary to call a mold remediation professional before having your crawl space encapsulated. During your in-home consultation, we will evaluate the condition of your crawl space and recommend the best solution. If you have a mold problem in your crawl space, don't let it affect your family's health. Contact us today to schedule your in-home consultation, which includes a free crawl space repair cost estimate. MidSouth Crawlspace Solutions is a trusted crawl space contractor in Jackson and Central Mississippi. We specialize in crawl space encapsulation, moisture control, mold treatment, and more. Call us today and let us know how we can help!